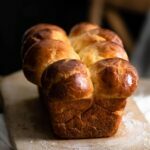 Brioche Nanterre a layered loaf made with balls of brioche bread. Enriched french bread shaped into a light buttery loaf for breakfast! In a medium bowl whisk together bread flour, sugar, and salt. Set aside. In the bowl of stand mixer, combine warm milk and yeast. (Milk should be 100-110F | 37-43 C)Give a gentle stir, then spoon your All Purpose flour over the wet yeast to create a blanket. Let sit 10-15 minutes until you see a crack in the flour. ( If your milk was the correct temperature, the flour works as a barrier to trap the heat and activate the yeast. Once the yeast mixture is ready, add the eggs. Using a dough hook, start to mix on medium speed. Take a spatula and gently scraping bottom of bowl once to incorporate all the ingredients. After eggs are mixed in, slowly spoon in the flour mixture on medium speed. Turn the speed to medium high and let it beat the mixture until a 'dryish' ball forms. Make sure each piece of butter is incorporated before adding the next. The dough should be sticking to the hook and as it twirls grabbing the butter. The dough will be lightly sticky. Pull the dough from the hook and scrape off the bowl. Place your dough in a lightly floured medium-large bowl. Cover it with plastic wrap. The first proof should be in a warm draft free location for up to 2 hrs. It may take a bit longer depending on location. The dough should double in size. Punch down the dough to release the air. Cover back up and place in the fridge. The second proof is cold and should take about two hours. Punch down the excess air once again, cover and leave in the fridge overnight(8 hrs). Remove dough from fridge the next morning, and scrape out of bowl onto a lightly floured surface. The dough should be firm, resembling cookie dough. Weigh your dough and evenly divide into 16 pieces. Prepare your loaf pan with a light coating of non-stick spray and line the bottom with parchment paper. To roll your dough balls, simply take one piece and cup your hand over top. Use light pressure, then vigorously roll in a small circle. You should be able to roll a nice smooth ball. Repeat with all the dough pieces. Arrange 8 balls in a row on the bottom of pan. Lightly coat your first layer with egg wash.
Place the final 8 balls directly on top of the first row. Do not press down. Apply a thin coating of egg wash. Apply a final thin coat of egg wash before baking. Bake for 25-30 minutes. Halfway through baking lightly make an aluminum foil tent to cover your loaf to prevent over browning. Loaf is cooked when knife inserted comes out clean without raw dough. Or has reached an internal temperature of 190 F.